The often used Bubinga species for example are listed on CITES, a reason for me to do not buy devices made from this wood any longer. nonbeliever, beyond6strings, muunch and 2 others like this. Not every day in the Vapwood shop is super productive. Yesterday was one of those days. The Elite may have to grow a bit, in height, to accommodate the cover plate. I may be able to shrink the mortise that houses the board by a mm or 2 (that's all I need is a couple of mm's). The lack of meat resulted in a last minute tear out right at the cover plate attachment point, blah, blah, blah, no prototype for Alan. I'm working today, tomorrow, so I'll be back at it Thursday. I've still been playing around in Watts mode. Very simple, easy to get a really quick hit. The lower wattage seems to allow you to milk the stem much more efficiently without stirring. It's also a battery saver. I went through only one battery all day yesterday. GreenHopper, Easywider, muunch and 3 others like this. I went through only one battery all day yesterday. Do you typically use more than one battery per day with regular Lil Buds? Also, take your time refining the beast! P.A.M. and GreenHopper like this. I think Mike is referring to toning down the wattage on the DNA helping conserve the battery energy. Not sure exactly what the general average per battery the LB is ?? with different vaping styles some get 3-4 sessions like some get 5-6 perhaps even 7 on a new cell. I'd throw in average draw amounts because there seemed to be a consensus at one point but I don't recall the number . So many factors come into play such as herb dryness, bowl size, vaping style , etc. The LB does accommodate many vaping styles and dry or damp, small or big loads, it's just that each factor contribute to the amount of draws one will total on average per battery. The OG Lil'Bud is battery friendly. I personally get an entire day of vaping on a good battery. Battery efficiency between the LB vs LB Elite will be interesting to see. GreenHopper, Mr. Gweilo 420 and muunch like this. What I think is happening with battery efficiency is I can take batts down to 350 and still feel like it's a new battery. This gives me a couple more sessions. There is also an improvement with weed efficiency, and the need to stir is reduced. Don't get me wrong, one last stir can milk a load totally. In wattage mode, I can almost stir with the watts. Start at 29, then bump up to 30, 31, one last stir at 32. Sometimes, maybe if I load lighter, I can milk a load, no stir, at 29. Either way, quite the lengthy session off a tenth of a gram or so. GreenHopper, muunch and Mr. Gweilo 420 like this. Slickwilly, nonbeliever, 6079Smith and 11 others like this. Okay, this was the first challenge that needed to be addressed. A little research revealed that the white screen is a common issue, and it's pretty much always about the screen not being installed correctly. The screen ZIF connector is the culprit, which is basically a ribbon that needs to be plugged into a tiny little toggle plug. Very easy to be a hair off and get the dreaded white screen. There could also be damage to the ZIF connector after too much rough handling. Good thing is the screens are sold as a replacement item for about $12, and can be easily changed, even after final assembly. So I get a prototype assembled, and BAM, white screen. I realized that I need a way to test the board after it's wired up, and mounted to the cover plate, and BEFORE final assembly. I converted a previous prototype wannabe into a testing unit. This came in really handy today, making sure the screen is installed properly, and not damaged after assembly. The wired up board can now be dropped into any Elite, and it's been previously tested. I can now put together board, cover plate, buttons, screen, wires, and set the whole thing aside until I'm ready for final assembly. I could even attach the coil, but that'll probably wait til the very end. This will accelerate production. Final assembly is actually a bit easier because of the way the final wiring happens. The wire BOX is now a wire CAP (same shape / external dimensions, more open internally), as I don't have to wire through it, but can just lay the cap in place as the very last part of final assembly. This allows me to make all connections, and then install the cap, very nice bonus for me, as this give me lots of access while making final connections, ensuring everything is nice and neat, with no shorts. On the next, and probably final prototype, I'm going to increase unit height by 2 mm (96) to make installing the cover plate a little easier. Width and thickness are good as is. I can increase the depth of the board mortise by 1 mm (from 12 to 13 mm), as I could use a bit more clearance under the board. This keeps the width at 70 mm. Thickness isn't an issue, it stays at 29 mm. The original plan was to use set machine screws, tapping a hole in the wood. I wasn't happy with the bite of the tapped hole in the small end grain area. I searched and searched, and came up with a wood screw version of a set screw. It's a Euro pozi screw (headless), and is used to fasten cabinet hinges. It's a wood screw, with deeper threads, should bite. I also have another idea I'm exploring that i like even more. nonbeliever, P.A.M., Mr. Me2 and 3 others like this. Yesterday was a really successful day - R&D wise. We learned much about the DNA 75c. 1. It's way more durable that I thought. I can solder at a relatively high temp, several times on the same board, with no ill effect. 2. The finicky screen, which can be swapped out, needs to be just right. It is worth the effort to make sure this is the case before assembling the unit. We also nailed down wire length coming from the board, and a way to maximize coil lead length to allow minimal heating of the board (you can monitor board temp). This was a direct result of converting the Wire Box into a Cap, giving me full internal access until that caps goes on. The design is falling nicely into place. Dare I say, we have a winner here. Special thanks to @P.A.M. for getting me to turn down my watts to 28. Now I feel like I'm *stirring with watts*, almost completely cooking my load by bumping up wattage, with a single stir at the very end because I can't bare to waste. I'm in love with wattage control. I guess it's my Classic roots, but not messing with temp (even though my profile temp max is set at 450, not sure if this is just waived in watts mode, but it is still listed in diagnostics). 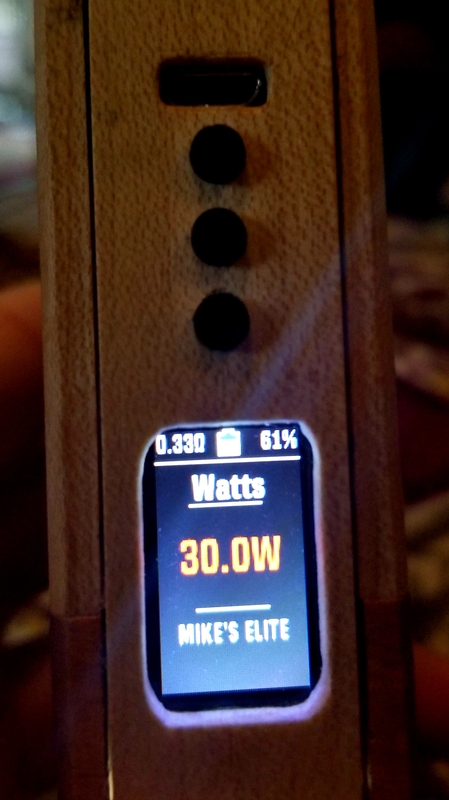 Resistance is set at 33 ohms, and watts from 28 to 32. This is truly LB heaven, as I enjoy a really long, super smooth, endlessly tasty, session. One last observation after going regulated for a week. The Elite is the most efficient machine I've every used. In my short experience, I've found that I can have a lot of control over the temp in the tube, and that is what it's all about. The more I can keep my herb at the proper temp without going over, the more magic will be released. Right now I mastering this process in watts mode. I'm quite amazed at the length, quality, and power of the session, with low battery drain, and under .1 grams of weed. I'm very pleased both personally for my own use (that's how this all started), and as a vape maker / seller. HerbieVonVapster, nonbeliever, Alex3oe and 2 others like this. Got any pics of the cap @Bravesst? HerbieVonVapster, GreenHopper and Bravesst like this. The Wire Cap looks just like a switch box from the exterior. It's the internals that are different, allowing easy access to all wiring before final assembly. It looks pretty much like the Classic s/b, but a bit larger (about 40 x 40 mm). I just roughed out some Walnut, Curly Maple (very nice stable wood), and Cherry Elite bodies. I kinda forgot that the wire box, with grain flipped, requires thicker stock to start with, so I need some more cherry. I'm gonna pick up some 1 3/4 table leg turning squares that'll serve as the perfect blanks for wire boxes. It's a process building something for the first time, but the Elite is very well thought out, and once things get moving, problems will be minimal because much of the Elite design specs are inherited from the Classic, which I've already tweaked to a very high level. I am very happy with the board itself, and the marriage of Lil' Bud and the DNA 75c is going very smoothly. The white screen was a scare, but easily figured out. The next two weeks should produce some pretty cool stuff. I'm waiting on some parts, buttons, wood stock, need to build some coils, but after that, real production should begin. elykpeace, chimpybits, duff and 4 others like this. Another stellar day in the shop. I've got 8 Elite bodies (walnut and curly maple) with another 8 (cherry) being formed. Right now I'm making quick work of the battery compartment mortise. Next it's drilling and wire box cutting, before you know it, we'll be prepping the first batch of Elites for final shipping. My boards and cover plates are a completely separate job, and that's why I make the observation this is like building 2 vapes. Once the board and cover plates are all set, it's a simple task of dropping it, and a coil, into any Elite body. Slickwilly, HerbieVonVapster, elykpeace and 5 others like this. Elite Batch One - Lots left to do! Slickwilly, el sargantano, nonbeliever and 8 others like this. @Bravesst is batch one still open or is it full already im guessing one is for @Alan leaving 15 total for purchase? I'm still not sure where batch one ends and batch two begins, and the two may overlap. Let me explain. I have about 20 orders for Walnut / Cherry / Blends / Maple. I'm waiting on some materials (buttons / wood stock, coil stock) for the Blends and Wire Boxes. Flipping the grain of the w/b means I have to start with larger stock, which I had to order, as well as the wood for the Blends. In the meantime, I don't want to sit idle. I'll be taking things as far as I can with everything, while I wait on parts, including working on my Feb Classic batch. That may result in varied shipping times. HerbieVonVapster, Easywider, GreenHopper and 1 other person like this. Today's gonna be a productive day. I may halt the production process and assemble another prototype. I'm a little selfish in this decision, because I'm having so much fun testing. My personal preference is the simplicity of wattage mode, with temp control shut off, but I've played with just about every option. Temperature, without really knowing the temp, rather going by taste and feel of vapor, is automatically controlled, you just don't know what it is. I've had the best results with zero issues in the simplest format, but that may be because it's the easiest to figure out. Another reason I want to get a couple of units assembled - comparison. Next prototype will feature a couple of very small changes, but the biggest change is how I will fix the cover plate to the unit, which is still not completely settled. The mortise for the board is going to be a hair deeper (1 mm), and the unit itself may wind up a couple of mm's taller, but that's not settled either. This build will decide. GreenHopper, NizzyJones and muunch like this. I did something in the build process I've never tried before. I left the batch behind, and took one unit to pre-assembly. This allowed me to verify all specs, especially in regard to DNA mortise / coil placement, and everything that goes with that. Everything panned out, and I was able to apply the tweaks to the entire batch. Normally, the coil is mounted to a one inch x 1/8" wood disk. With the tighter tolerances of the Elite, I shrunk this to a 7/8" disk. The coil, which is now no more than 14 mm's in diameter, easily fits on a smaller disk. I can't wait to assemble my first unit with an @Alan rolled coil mounted to a 7/8" disk. This eliminates the need for the clearance groove in the coil compartment, adding more efficiency to the process. The smaller disk will probably work just as well on the Classic, also eliminating the need for the post clearance groove, saving a fussy job (5 minutes per unit). Other developments. I had thick stock for Walnut wire boxes and Maple wire boxes, but I'm waiting on Cherry stock. I decided to improvise on a couple of units (made a couple extra cherries for prototypes) with a Koa wire box. Koa end grain, which is very visible, looks incredible with Cherry, but I wasn't sure it would hold up to the mortise. It did! I had some Koa lying around (thanks to @P.A.M.) that was large enough for wire boxes. If you're on the list for a Cherry Elite and want a Cherry / Koa, let me know. I'll be posting pics of the prototype soon, possibly tomorrow. So there are 16 units ready for pre-assembly. Wire boxes cut and fit to the units as well. On the cover plate / board side, I have all wires prepped, ready to go. Once more buttons and coils arrive, I'll be ready to assemble multiple units. I think the plan for this week is to get a prototype or two working, and then fill my February Classic order, kind of clear the work bench, before putting it all together. The final process should come together pretty easily, as it's all been done. Time to get a little sentimental. We did it. Alan's idea, design, and knowledge, paired with my skills, persistence, and insatiable VAS have culminated into a hand crafted work of art, packed full of cutting edge vape technology. We all owe the Jedhi Master a big thank you. 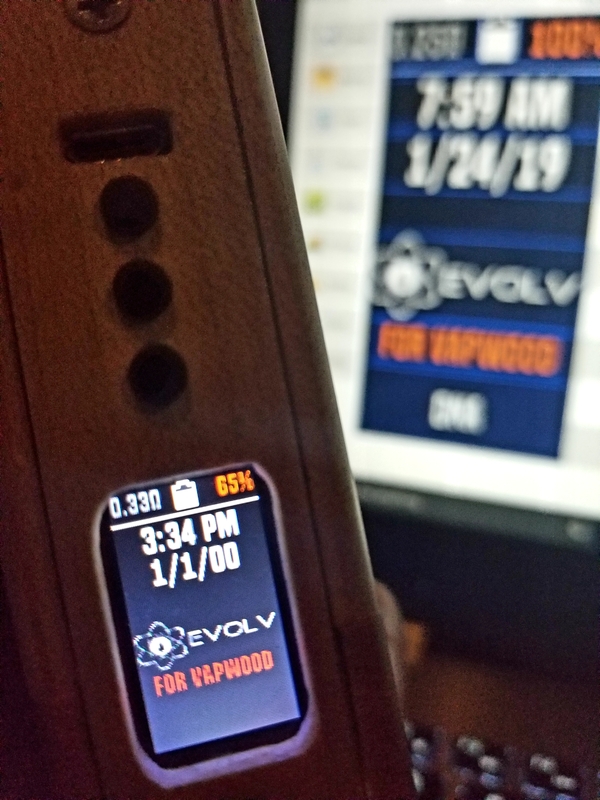 I've also got to hand it to the guys at Evolv, the DNA 75c is user friendly, and not an overwhelming amount of technology, unless you want it to be. Combustion is basically not possible. A bad hit really isn't possible. And if you're not a tech person, or just not a tech person when you vape, pop it on watts mode, and enjoy. How do I know the Elite is a success? From the moment it was built, my one and only prototype became my new DD - instantly! As a matter of fact, I haven't used anything else. The buttons work perfectly, very easy, logical, quick to go from setting to setting with one hand. I'm a one handed vapist, and this made me real happy. Anyone with any hand strain issues will love the Elite. If something happened to my unit, I'd do everything in my power to build another one ASAP. muunch, Slickwilly, lookhigh and 11 others like this. We all owe the Jedhi Master a big thank you. Are you sure you're not forgetting someone? Thanks, big guy in the sky ! Bravesst and Mr. Gweilo 420 like this. elykpeace and Bravesst like this. I'm excited to get another prototype built before finishing up my batch of Classics. If I had a few more sets of buttons, I'd see if I could bang out three or four. Just for the prototype, I may attempt to modify some stock buttons. I'd also like to get a pic of the super cool Cherry / Koa combo. Since I've got stock, these will probably get built first. If you're interested in a Cherry / Koa Elite, select Cherry as the main hardwood, and use coupon code KOA at checkout, and you will also save $30. I'm going to see about Koa cover plates (and possibly back plate) to match. GreenHopper, P.A.M., Easywider and 1 other person like this. Please don't post anything that will re-open this feud. If this escalates further then points will be issued. Thanks for your co-operation. GreenHopper, beyond6strings, duff and 1 other person like this. So close to prototype #2, but there was a hitch at the very end just before assembly completion - although a small hitch. I decided to build a cherry cover plate, mount a board to it, and wired it up with screen and buttons installed and tested. I'm trying to determine the best wire length from board to coil. The longer the wire (14 gauge), the cooler the board should stay, at least theoretically. So instead of trying to keep wires as short as possible, I'm using the accessibility and extra space the wire box provides to neatly coil a couple of inches of wire between the coil and board, neatly folded into the wire box. The idea is a sound one, but the configuration of the wire folds has to change. Simple adjustment, but enough to prevent me from getting a prototype done today. The unit I was working on is a Cherry / Koa. When I finished it with beeswax, the Koa end grain (visible from each side of the unit) turned really dark and glass like, super cool effect with the cherry. Slickwilly, GreenHopper, beyond6strings and 5 others like this. Small hitch in the big scheme of things . It's basically a gain of knowledge and productivity due to your willingness & openess to adapt where needed to build a superior vape. Not all seek to improve things even if aint broken like you do. Well done , Captain! I notice you installed fire button on the bottom was that to keep with the lil bud style or for other reason? There's a page about it somewhere in the thread , it's almost a win-lose either way , can't please all . From what I remember members were talking about it's offers more options of holding and manoeuvring the Elite , more so if having physical health symptoms . As to keep it in Style with the LB , I guess it does do that . Not trying to answer for Mike just resuming that page of posts from what I remember . The first Elite draft or layout if you will , did have the button on top, which led to the discussion about it..
Edit: @HerbieVonVapster , it's possible it was talked about in the LB Classic thread if can't be found in this one .